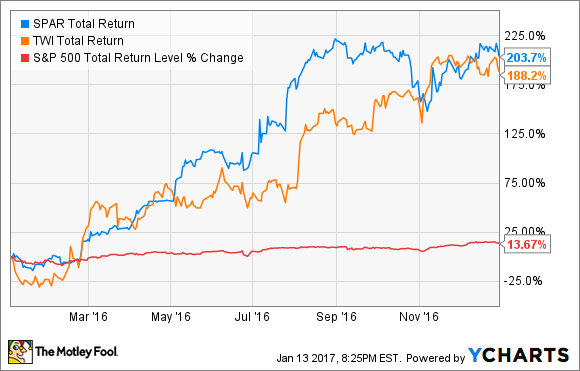 Spartan Motors Inc. and Titan International Inc, all made investors much, much richer in 2016. The party might not be over yet, either -- at least for two of these companies. If you had invested $1,000 each in these two companies at the start of 2016, you'd have nearly doubled your money, with a total return of $3,919 in one year's time. The best part? Even after this remarkable run, both companies are positioned to have a good 2017, so long as a few things go their way. Big tire demand could rebound strongly in 2017. Image source: Getty Images. Think about farming and mining equipment -- tires and wheels that can weigh as much as and cost more than the car you drive to work. The reality is, sales of these kinds of tires have been poor over the past several years, with demand from the agriculture, natural resources, and energy industries all having come to a halt. However, there's some reason to think that the worst may be over, with activity looking to have picked up over the past year, and expected to continue improving in 2017. There's also potential positive news on the political front for Titan, an American company that manufactures many of its products in the USA. The company currently has trade cases pending determination with the U.S. International Trade Commission, asking for countervailing duties against Indian and Sri Lankan competitors, and it's likely a Trump administration would even more aggressively pursue trade actions against anti-competitive trade practices. However, there is a downside, too. An overly aggressive Trump trade policy could make it harder for Titan to compete in some overseas markets. Either way, after a very tough past few years, Titan seems to have begun turning around from the worst of the downturn in the industries it serves. Revenue is still down 41% from the peak in 2014, and cash flows are still down over 50%, but both cash from operations and free cash flow were positive last year, and up by double digits from 2015. It's likely that the company will continue growing cash flows in 2017. Spartan International's management deserves credit for a solid 2016. The fourth quarter's results are still pending, but the company did grow sales a decent 7% over the most recent 12 months reported. The big turnaround was in generating significant cash flow growth by improving the company's operations and cost structure, both in operating expense and manufacturing input costs. 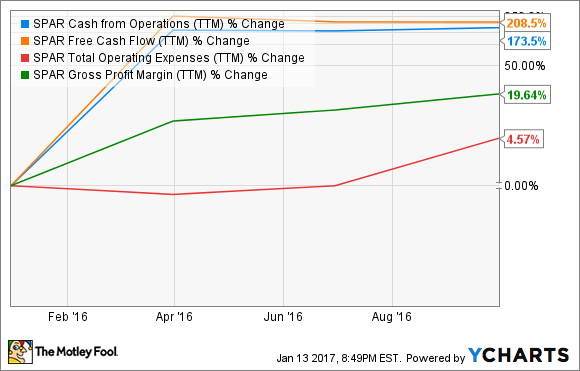 Operating and free cash flows were up a very impressive 174% and 209%, respectively, gross margin percent was up sharply, and operating expenses increased only 4.6%. The big challenge for Spartan will be how it manages its business with relation to demand. The company manufactures and designs custom, often application-specific vehicles, such as fire and emergency response, RV, delivery, and defense, and has commanded strong market share positions in many of the vehicle categories it competes in. However, the company had lost ground in recent years, particularly in its emergency vehicle business, because of a number of quality and reliability issues. Over the past year-plus, the company has started to move past those legacy issues, and the fruits are paying off with sales growth. At the same time, the company has started to grow its RV chassis business and last-mile delivery vehicle sales, and doing it more profitably. Factor a strong balance sheet with very little debt in with the positive cash flows and expectations that they will continue to grow, and Spartan is poised to continue rewarding shareholders in the years ahead. There's no getting around it: Expecting to double your money again in 2017 is unreasonable. After all, both Titan and Spartan need to see strong economic demand for 2017 to be successful, and market demand can shift unexpectedly. Also, neither stock is exactly cheap, trading at relatively premium valuations on sparse recent profitability. But if they can take yet another step forward in 2017 on a combination of strong demand and continued operating improvements, it's not out of the question that profits could surge in 2017, delivering another market-beating year for investors. If the economy weakens, or either company backslides on operating improvements, last year's gains could be at risk. With that said, both companies seem in good position to do well in the years ahead.